Here an Archivist, There an Archivist . . .
Green-Wood is fortunate to have Tony Cucchiara as its archivist. Tony knows what he is doing. He worked at Brooklyn College for years, before retiring from there as professor emeritus. He has taught generations of archivists who work at New York’s leading cultural institutions. He continues to educate budding archivists at Pratt. 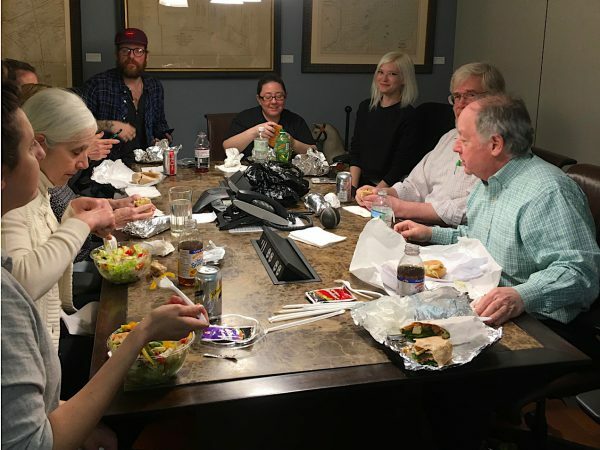 And for the last 10 years or so he has been working on Green-Wood’s massive records–typically multiple documents that catalogue 574,000 burials and all related matters, including familial relationships, businesses, and much much more. Tony hit a new high just a week ago: Green-Wood’s executive offices were packed with volunteers, interns, and paid staff whom he had recruited. Connie and Mina were processing the records salvaged from the Brooklyn Monument Company’s offices when Green-Wood purchased its land on nearby 25th Street. Herb was working on the Restoration Company’s records concerning its work on Green-Wood’s Arches and several monuments. Wesley was using a light box and a magnifier to examine glass lantern slides of New York City from a century ago, then recording his careful observations in a spreadsheet. Marie was cleaning, mending and encapsulating oversized blueprints of mausolea, as well as drawings and rubbings. Courtney worked at organizing single grave selections. Christina was researching family histories as supervisor of Green-Wood’s Green-ealogy program. It was a full house of archivists! Green-Wood’s volunteers, interns, and staff enjoying their lunch together. Some are studying to be archivists and some just love history. There are always great surprises to be found in Green-Wood’s voluminous records. 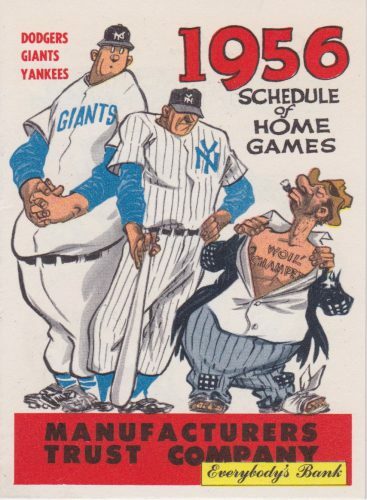 Just recently, in an envelope sent by the Manufacturers Trust Company in 1956, Connie and Mina found a home game schedule for New York’s THREE baseball teams: the Brooklyn Dodgers, New York Giants, and New York Yankees. This was the second-to-last year that New York City would have three baseball teams; the Dodgers and Giants, sadly, would desert the Big Apple for California after the 1957 season. The cover of the 1956 schedules for New York City’s major league baseball teams: the New York Giants, the New York Yankees in pinstripes, and the Brooklyn Dodgers (known fondly back then as “Da Bums),” courtesy of Manufacturers Trust Company. 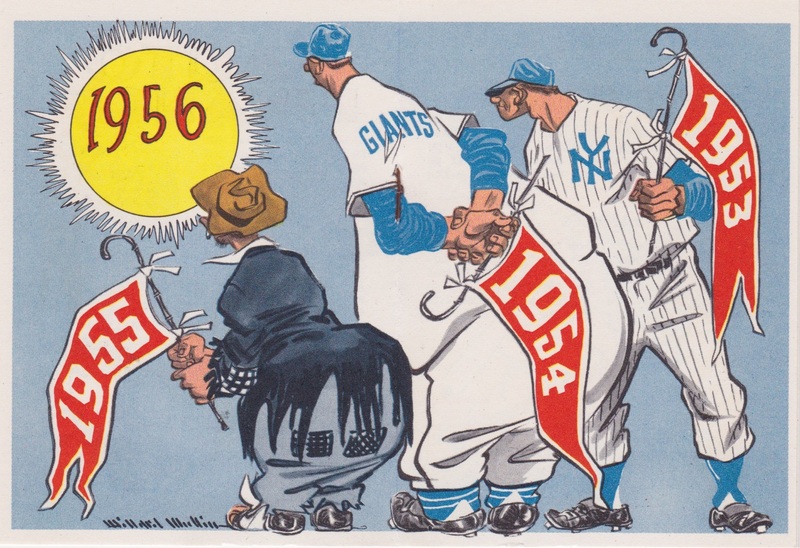 A celebration of the success of New York’s major league baseball teams (left to right): The Dodgers, who won their only World Series championship in 1955, the Giants, who won the World Series in 1954, and the Yankees, who won the World Series in 1953, defeating the Dodgers in 6 games (their 5th World Series in a row, a record that is unmatched). A golden age of NYC baseball! In organizing, preserving, and processing Green-Wood’s millions of pieces of paper, many of which are now accessible to the public through our Green-ealogy program, we sometimes come across a long-forgotten gem. 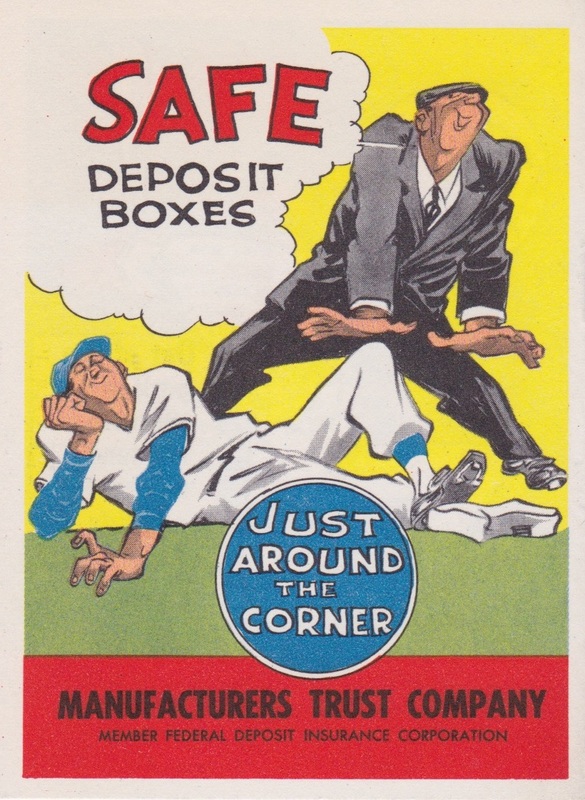 This baseball calendar is just our latest example. Thanks to all–interns, volunteers, and staff–who make the processing of Green-Wood’s extensive and unique archives possible! Brooklyn Dodgers, New York Giants, New York Yankees, Tony Cucchiara.